which, though not the first, nor complete, was and is the best attempt at a unified history of conjuring. Clark’s story is told in The Barrister in the Circle (1983) by Eddie Dawes, who also gives an account of the birth of the Annals in his Preface to Todd Karr’s magnificent edition of Clarke’s monumental work. Briefly: A notice of Clarke’s intention to publish a history of conjuring was first announced in George Johnson’s The Magic Wand (1919-20). The lack of response would have left the project stillborn, had not Johnson decided to serialise it in his magazine, where it ran between 1924 and 1928. Subsequently these issues became highly sought-after and attracted a premium price. My yearly visits to London always included a stop at Davenport’s Magic Shop in Great Russell Street where Patrick Page, the manager and a fellow Scot, allowed me to sort through hundreds of secondhand magazines to add to my collection. The wily Pat usually abstracted the Magic Wands with Clarke’s articles – after I had done the sorting process for him. Nevertheless, over the years I accumulated some, if not all, of Clarke’s history – and Duncan Johnstone allowed me to read from one of his three complete sets of the Annals, none of which he would sell. As you may imagine, I read and re-read these articles – frustrating, whenever I came to a gap in my collection. Years later ,in 1983, Magico Publishing in New York republished the entire work and I was able to have it on my shelves. Then, one day early in 1999, I wandered in to Cooper Hay’s antiquarian bookshop in Glasgow. I have known Cooper from his days in John Smith’s bookshop and over the years through him I have managed to acquire some of my best loved books, including the fifth edition of Henry Dean’s Whole Art of Legerdemain (1762) (the first magic book published in Scotland), as well as the first, second and third editions of Reginald Scot’s Discoverie of Witchcraft (1584, 1661 and 1665. respectively). The reason was an article by one Arthur Watson in the Reliquary and Illustrated Archaeologist entitled simply, ‘Conjurers.’ I began to read, and certain words and phrases jumped out at me. It was clear that Mr Watson had read Clarke. Some illustrations were more than familiar. Then I read a description of a Roman oil lamp, with the lamp illustrated, and I remembered this from reading the Annals at the home of Duncan Johnstone although I did not recall Clarke having a photograph of the lamp. I turned to the title page of the volume: publication date 1909. This was fifteen years before the Annals appeared in print. Cooper had offered a copy of the article. I replied I should have to buy the volume. Bad news. It was one of a set of fifteen. However, Cooper’s price was not excessive, and in the other volumes I found articles by Watson on Funambulists, Jugglers and Tumblers. Good news! That summer the American slight of hand expert and bibliophile Ricky Jay was in London performing his one man show: ‘Ricky Jay and his 52 assistants’. I had an invitation to attend. As usual when in London, I stayed with another magician and print collector, Bob Read. I had made copies of the Watson articles for Bob, knowing he would find them very interesting. Neither Bob nor Ricky had heard of Arthur Watson. 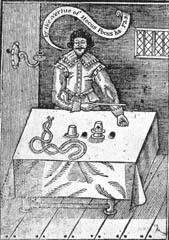 Of course, by this time I had consulted Eddie Dawes, the foremost historian of conjuring. Again a blank. Another friend, Persi Diaconis, Professor of Statistics at Stanford University and also a slight of hand card expert and collector had not heard of Watson either. Was it possible that Clarke, who makes no mention of Watson, had plagiarised these articles, or had he unknowingly repeated the research Watson had done earlier? After Ricky Jay’s performance, Ricky, Bob and I visited the British museum where Sheila O’Connell, despite being in the middle of curating an ephemera exhibition, had searched out some early conjuring prints for us to examine – including the Baldini ‘Luna’ print from the Seven Planets. As we signed the visitors’ book, I asked Sheila if they still had all the pre-war visitors’ books. Arthur Watson must be in there! Over the phone, Eddie, Bob and I drew up a profile of Arthur Watson, who had not been a member of the Magic Circle. Bob became Watson’s Sherlock Holmes. It’s a fascinating story. I was pleased to be present in 2005 when Bob gave a talk on his Watson research to the Wolverhampton Circle of Magicians, and again when he repeated it with great success at the Ninth Conference on Magic History in Los Angeles. Gordon Bruce, curator of the Scottish Magic Archive, welcomes any information regarding magic performers and performances in Scotland. He may be contacted by post at the Scottish Magic Archive, 32 Cathkin Road, Glasgow, G42 9UH (visits to the archive are by appointment only). One Comment on "Watson Sherlocked"
As always, Gordon never fails to impress me with tales of his past. Keep up the good work.